Please note that StoryNight is ON for tonight at Hague Park on Grove Street, off Oradell Avenue, in Oradell! It is a bit chilly, so wear layers and bring a good fall jacket, along with the other suggested items! See you soon! See our HAPPENINGS page - under the pictured event flyer - for a full list of instructions and directions! We very much prefer that you pre-register for our event so that we know how many people to expect! However, we will turn away no guests, as long as you sign-in at our Registration Table! TICKETS ON SALE NOW FOR HACKENSACK RIVER STORYNIGHT - CALL/EMAIL US NOW TO ORDER YOURS! Purchase tickets now for our very special fundraiser set for the almost full moon night of Sunday, September 23rd. See the orange-highlighted text below for details. The event will feature live music, a dance recital, story telling, a walk to the river, native plants, refreshments, and a silent auction - all in celebration of the Hackensack River Watershed. We'll take a lantern walk to the bridge over the river at Oradell Avenue, where we'll share a few water-themed poems in honor of the late great Mark Becker, SWAN founder and Co-Director, who passed from this Earth four years ago. Live music will be performed by the amazingly talented guitarist, guitar maker, singer-songwriter, artist, Buck Curren (of the Psych Folk duo Arborea). Art of Motion Dance Theatre will perform their graceful butterfly dance with dancer-pollinators wearing artist Annie Hickman's whimsical creature costumes. Email bergenswanrsvp@gmail.com or call the office at 201-666-1877 to reserve your tickets and have them sent to you via email or mail. We depend on volunteers to make our events a succcess. Please contact us if you can help plan, fund, and work at our StoryNight! Walk Rescheduled to June 2 rain date! Please note that the guided nature walk scheduled for Saturday, May 19 - Emerson Woods Preserve Spring Walk by Numbers - has been shifted to our rain date of June 2. The times are the same - 3pm to 5pm. If you can make the new date, please email us at bergenswanrsvp@gmail.com to sign up! See below and our Happenings page for further details! Also note that, though participants must sign up in advance, this walk is donation based. Your participation isn't based on paying a fee. Of course, Bergen SWAN runs on your generous donations and all monies raised go toward our goal of promoting healthy watershed stewardship in it's many forms. April 8 - Help us wake up our Westwood pollinator gardens for the spring! We'll be having a work party at our two small stream-front beds at Girl Scout Park on Third Avenue. April 22 - Stop by the SWAN Earth Day table at the Bergen County Historical Society's "Under the Shad Moon, Chwame Gischuch/Lenape New Year festival. Just of few of the many things to see and learn about are the culture of the original native peoples and Dutch settlers of our region, prehistoric tools the world over, and blacksmithing, and you can enter and tour 3 beautiful early sandstone homes. April 28 - Several SWAN members plan to attend a unique spring stroll and wine-tasting event at the Cooper's Pond historic park on the Hirschfield Brook in Bergenfield. If you would like to be part of it, go to Meetup, find the link and pre-register for the "Russian River Valley Wine-tasting." June 2 - Sign up for our very first guided nature walk of the season and the inaugural event for SWAN's newly revised trail guide for the Emerson Woods Preserve. Led by lifelong Emerson resident, woods lover, and naturalist Ken Hoffman, the walk will follow the 16 numbered stops along the main and side trails of this wetland woods. Go to our Happenings page to see the flyer for more info. Coming in September - Our next memorable, magical StoryNight event. We are working on securing an outdoor venue for this near to the Hackensack River. Another informative and inspiring talk in our Landscaping for the Watershed series - this one about the important relationships between soil and water. Guided paddles on the Woodcliff Lake and Old Tappan reservoirs. We will be posting exact dates, times, places, and other details over the weeks to come. Please call or email with any questions or suggestions! Happy spring! This year, Bergen SWAN turns 30 years old! It has been an amazing, tumultuous, challenging three decades, during which we have weathered hard-won accomplishments and plenty of setbacks, yet somehow kept afloat. With your support and that of those who came before, we've prevented development of thousands of acres of reservoir and river bordering forests; helped enact a NJ State law (the Watershed Protection Act); set in place an Open Space Trust Fund for our County; kept a keen eye on stewardship of preserved lands in the Upper Watershed; and, through walks, paddles, talks, and workshops, opened up countless sets of eyes to the beauty and functionality of our wondrous watershed - still beautiful, despite shouldering such tremendous population density. We hope you will continue to support us by attending our programs, keeping in touch, and providing your generous donations. To celebrate our landmark year, this year's events will feature a new twist on some old favorites...guided nature walks and paddles, a how-to workshop, some rain garden installations, and a very special StoryNight under-the-stars. Our calendar will be posted within the next week or two. We look forward to seeing you soon! A Friends of Bergen SWAN Fall Benefit Saleis planned for November 4&5 at "SWAN Central" in Hillsdale, NJ. Come browse and buy at our outdoor sale and support our environmental work. Lots of wonderful things to buy - starting at 10 AM. Go to the flyer on our Happenings page for more information. Benefit Sale," a fundraiser to be held on May 6 at Westwood RR Station to help pay for our upcoming environmental education events. there's lots of work to do! 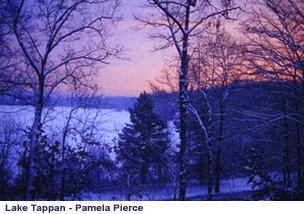 of Old Tappan Woods," guided by conservationist / author / Hudsonia Exec. Director, Erik Kiviat, who will discuss the diverse flora and fauna of a mature urban forest, and how the life in a floodplain contributes to water quantity and quality. A Friends of Bergen SWAN Fall Benefit Sale is planned for November 4&5. Come browse and buy at our outdoor sale and support our environmental work. October 15, with superb naturalist and wildlife biologist Travis Brady. And we hope to geat up for a hike/movie double-feature for sometime in December. Follow this site for additional details...! See the 'Get Involved' page! You can virtually shop online on our Resources page for scores of decorative and functional items. View our extensive lists of housewares, art, handcrafts, supplies, lamps, linens, appliances and office supplies, all on sale to benefit our environmental education work. The lists contain specs, descriptions, and photographs of a wide variety of wonderful and affordable items. We will accept all reasonable offers! Click here to go to the item lists, return often for new items and updates. Start your search online and then come to our impromptu SWAN "store" to make your purchases. If you see something you would like to purchase, just call us at 201-866-1877 or email us at bergenswan@sprynet.com, subject "Online Sale", for more information about the item(s) and to arrange payment and pick-up. Our Landscaping for the Watershed workshops and pollinator garden project turned out to be very successful. Among all the pollinators seen in the garden, hummingbirds and monarch butterflies have been visiting! And though 2016 is almost gone, our work goes on. We continue efforts to safeguard open space. The plantings at the Emerson Woods stream restoration project need tending and monitoring. We are conducting an inventory of green infrastructure and open space opportunities in Hillsdale and Westwood that will benefit stormwater management. We are also re-organizing our headquarters and operations. If you would like to help please go to our Get Involved page and contact us! It is with deep sadness that we inform the Bergen SWAN community of the sudden, tragic death of Mark Becker on February 26, 2014. Since the start of Bergen SWAN in 1988, Mark has tirelessly worked for protection of our watershed and other natural areas, and the amount of his personal time, money, and energy spent for the benefit of all is incalculable. And for those of us who had the pleasure of working with him, his intelligence, generosity, and good humor makes this really a greater loss than we can say. The tremendous outpouring of love and support from the community, many dear friends, family members, colleagues and students has provided great comfort at this difficult time. Join us on another wonderful Paddle on the Spatterdock Marsh in West Nyack, NY on October 15. This time it will be with superb naturalist and wildlife biologist Travis Brady. Sign up early - pre-registration is required! Go to our Happenings page to view more information on the event flyer. Don't forget to set aside a spot for yourself and a friend at our upcoming evening walk through Old Tappan's Tom Sawyer-like winding woods along the Hackensack. It happens Sunday, July 9, starting at 6:00pm. 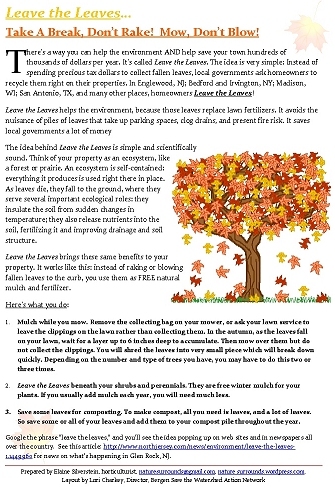 A much (or mulch) better way to take care of your lawn this fall! Also good for the important pollinators who use the leaves over the winter. Go to our Happenings page to read the flyer below. You can also right click to download the flyer and pass on the information to others. Join us at the Gorgeous Gorge Fall Photo Walk in Atkin's Glen, Park Ridge. Sunday, Oct. 23, 2016 from 2 to 4 PM. Explore the hidden beauty of Atkin’s Glen with nature photographer Charles Dexter. A wealth of hidden visual treasures can be discovered in this unique streamside habitat. The pristine Bear Brook flows through the ravine, creating small waterfalls, eddies, and still pools. Charles Dexter will help you sharpen your observation skills and create photographs that effectively communicate your reason for making them, whether they be for artistic or documentary purposes. Pre-registration is required. See the event's flyer on our Happenings page for contact and registration info. Help Yank out the Invasive Plants! Our stream restoration site along the Heck's Ditch in Emerson Woods Preserve has become host to some aggressive invasive plants - stilt grass, garlic mustard, pachysandra - and we need to get them in check so as to give the native plantings installed along the banks in 2013 a fighting chance. We'll supply gloves and bags and refreshments if you can give us an hour or two of your time and labor. We need only about 15 people total throughout the day. Please volunteer! See our Happenings page for the flyer . This is a leaderless and leisurely walk, just for time to spend listening to and learning from the critters and each other. SWAN's two new summer interns - John Adriance and Hina Oryu - will tell us about some common nocturnal animals out and about at this time of year. Participation is limited to the first 25 people to register. Bring a dim lantern for yourself and a short favorite passage about the full moon to share with others. Admission is a minimum $5 donation to SWAN. We will post further details shortly on our Happenings page. Please stop by 6/10, 6/11, and 6/12 at SWAN Central - 141 Demarest Avenue, corner of Westdale Avenue in Hillsdale - and make your purchase of a beautiful and/or useful item to benefit our educational and advocacy work. We will have something for everyone: decorative items, housewares, linens, clothing, jewelry, books, photo equipment, appliances...some great items deeply discounted, some free. The sale hours are Friday, 3-7pm; Saturday/Sunday, 10am-6pm. Go to the HAPPENINGS page for our colorful event flyer! Attention: Lovers of Art, Crafs, Cool Stuff, Local Healthy Food, and Natural Cosmetic Products - Attend our Annual Fundraising Sale Next Week! The first 50 people to make a purchase of $50 or more at our sale will be given a free packet of milkweed seeds...favorite of treasured monarch butterflies. Local Sponsors: Bergen County Camera, Westwood; The B-Hive Organic Salon, Hillsdale; Old Hook Farm, Emerson; REJUVENATE Sanctuary, Westwood; Wild Birds Unlimited, Paramus. On Saturday, OCTOBER 17, Bergen SWAN will host a high end fall sale inside the Community Center in downtown Westwood, NJ. Tablers will showcase their own or others' lovely creations with a nature theme - art works, handmade goods, decorative items, ornaments, unusual wearables, nature books, locavore artisinal foods, eco services. Proceeds will benefit our work, and tablers will get to keep the profits from their sales. Some of the funds will go toward our continuing pollinator garden education campaign. In May 2015, we planted two small pollinator beds in Girl Scout Park, Westwood, and we hope to construct an information kiosk at the site. We are also working toward creating a rustic memorial arbor for SWAN Founder/Co-Director Mark G. Becker. And we want to continue our program of naturalist guided walks and paddles in the watershed woods. Email: bergenswanrsvp@gmail.com, Subject: Fall Sale! Our sucessfull April 14th workshop program continues with two more garden workshops focusing more on putting our words into action. The points covered during Part 1 will be translated into how-to techniques in Part 2 and put into practice during the Part 3 hands on planting. We will install a lovely pollinator garden in a streamside pocket park in Westwood. Both Parts 2 & 3 will be taught by Bill Kolvek, an instructor at New York Botanical Gardens, and owner of of Bill Kolvek Perennials, a nursery that features native plants. The program is sponsored by Bergen SWAN and underwritten by PSE&G. Cost is $10 per participant per workshop, and pre-registration is required. Go to the Happenings page for the event flyer with more information on registering. RESCHEDULED / NEW DATE ANNOUNCED! Featuring Carolyn Summers, author of Designing Gardens with Flora of the American East, this part one of three workshops will center on using native plants in your garden to benefit wildlife and our watershed. An intermission will feature refreshments and information tables. For the 2nd part of the program, Ms. Summers will show slides of inspirational ecologically beneficial gardens. The event will close with a two-way Q & A session with a panel of four local botanists, naturalists, and watershed experts. The program is sponsored by Bergen SWAN, the Nature Program Cooperative, PSE&G, the Bergen-Passaic Chapter of the Native Plant Society of New Jersey, and United Water New Jersey, which is hosting the program at its Haworth Water Treatment Plant on Lakeshore Drive. Cost is $10 per participant, and pre-registration is required. Go to the Happenings page for the event flyer and more information on registering. Annually, the congregation at Barnert Temple raises money and awareness for ten carefully selected grassroots organizations close to home and around the world. There will be something for everyone: interactive charity exhibits for children and adults; adult education with Rabbi Elyse Frishman, 9 – 10:30 am; a pancake breakfast and raffle. Go to our Happenings page to see the event flyer with a list of all ten organizations. Or, for more information and to donate online, go to www.barnerttemple.org/MitzvahMall. Click here to go to our event flyer: Happenings. Join us on Sunday, December 7 for a warming night of learning and exploration as we tell each other river stories by lantern light, at the stunning historic Demarest Railroad Station on the Tenakill Brook. We will be festively decorating the station for the occassion. The evening will start with a tribute to SWAN's Co-Director, Mark G. Becker, who was a huge fan of reading and listening to stories. Then hear Watershed Educator Nancy Slowik's Watershed Moments slide presentation, about our 2014 adventures on the trail and out on the water. This will be followed by tea and dessert, a silent auction, and a sale of winter seasonal goods. The night will cap off with a story circle led by playwright Will MacAdams, in which participants will relate a brief experience involving being on or near a waterway in the Hackensack River Watershed. Our story theme will be: Going by the Water: Experiences by Local Streams, Brooks, Lakes, Ponds & Rivers. Story telling participants will include watershed advocates Lori Charkey, Barton Knight, Nancy Slowik, Bill Sheehan, and Hugh Carola. Up to 15 guests will have the opportunity to tell their tales, based on whoever is first to sign up at registration. Admission to StoryNight is a minimum donation of $25 per person, but please contact us if this is a hardship and you need to pay on a sliding scale. To register, call us at 201-666-1877, or write us at bergenswan@sprynet.com, subject "StoryNight Registration." PayPal - See the Donate button to the right. Note: Please add an additional $2 per ticket to cover what PayPal charges us per transaction. Register early as space is limited to the first 40 participants! Earlier in the day on Sunday, December 7 come and join the Emerson Woods Clean Up and Invasive Pull. Invasive plants, many non-native, has become a very real problem everywhere. Persisently pulling and monitoring is the only way to control them without use of chemicals, which is especially important to avoid within watershed lands. It will start at the Emerson Woods Stream Restoration Project site, which SWAN spearheaded, on Main St. in Emerson. You must register with Annabelle Bower at ambassador@hackensackriverkeeper.org to join in. Go to SWAN's Happenings page to see the flyer for more information. An Afternoon Paddle on Lake Tappan Reservoir -- is on Sunday, September 7th. Come with us as we look for migrating hawks and shorebirds, and the wildflowers' last show of the summer. See Happenings for the flyer and more information, or email us at bergenswanrsvp@gmail.com. Join us on the first Sunday of summer in our first exploration of the Lake DeForest Reservoir! SWAN's Watershed Educator and Naturalist Nancy Slowik will guide us on this northern-most reservoir in our watershed. Go to the Happenings page for the flyer and more information on registering. Or email us at bergenswanrsvp@gmail.com. Participation is limited to 30 boats and entry is first -come first-served, so don't hesitate! Sign up now!! IMPORTANT: Please note that this Sunday's walk is fully booked! We are now taking names for a waiting list. Please email bergenswanrsvp@gmail.com to be added to this list and we will contact you if there is an opening. Thank you! If last year's nature walk at Lake Tappan was any indication, this walk will be excellent - yellow warblers, cedar waxwing, and Baltimore orioles were among the birds we saw, and an evening walk a great time to observe them. This was one of Mark's favorite trails to walk, especially at evening. Go to the Happenings page for the flyer and more information on registering. We invite you to join us at the IBM/Dolce Conference Center in Palisades, New York on Sunday, March 23rd, from 12:00 to 3:00 PM. For more information and to register to attend, go to the Eventbrite invitation page here. A Spring Nature Walk in Old Tappan Woods with Watershed Educator Nancy Slowik on April 27th! Old Tappan Woods is one of the largest watershed woods along the Upper Hackensack, and is marked by a wide diversity of wetland habitats. Please sign up in advance by emailing us at bergenswanRSVP@gmail.com. Those who pre-register prior to April 26 (original deadline extended) can pay $7 per person using the Donate button on this Home page. Or, register at the walk for $10 per person. New Jersey votes YES for a stable source of funding for OPEN SPACE! On November 4, 2014, voters in our state had the chance to support a measure to create a stable source of funding for NJ State Green Acres, and about 64% voted for it!. For more info on the issue, go to the Happenings page. Bergen County Blue Acres Ballot Question Passes with over 64% of the Vote! Voters approved the measure to allow existing funds from the Bergen County Open Space, Recreation, Farmland & Historic Preservation Trust Fund to also be used for "Blue Acres" projects, which help resolve the increased flooding problem in our watershed in the most environmentally wise manner - by restoring more flood plain. Click here to read all about it in an article in the Record. The Emerson Woods Stream Restoration Project Makes Great Strides! Phase one of the stream restoration project in Emerson Woods - to repair years of erosion damage that has been making the channel widen annually and become a safety and water quality hazard - has been completed. This phase included the installation of a stormseptor (a large concrete box that captures floatables and sediments), as well as the grading the banks of the stream, and the creation of a series of rock terraces to slow the movement of the water through the channel. Princeton Hydro performed the project’s engineering design and River Logic carried out the field work. Conservation Resources, Inc. provided on-site oversight, while the Borough of Emerson and Bergen SWAN provided additional logistical guidance. On Wednesday, July 24, 2013, the partner organizations gave their first explanatory talk and tour of the work-in-progress to a contingent of representatives from the Emerson Council, Environmental Commission, and Shade Tree Commission. Phase two, involving the planting of hundreds of plants, shrubs, and trees, has also been completed. A public commemoration for the project took place early fall. A Princeton Hydro blog that follows the stages of the project will be available via our website shorty. Now comes the job of tending all the new, vulnerable plantings. We will be posting additional information and photos about the project shortly. New Milford board meeting this next Monday, December 12th, 7 PM at the borough hall. Another developer is using the "builder's remedy" to force permission to build on 13.5 acres of land by the Hackensack River, which is prone to flooding. Meanwhile, Blue Acres funding is currently buying out downstream properties and returning them to natural flood plains. This makes no sense at all. See the flyer on our Happenings page, and go to this link to read (and download) a fact sheet and the flyer. Sunday September 20, 2015 from 3 to 5 pm. Come join the grassroots groups 350NJ and the Coalition to Ban Unsafe Oil Trains at their free public forum. The event will provide facts that will empower individuals and groups to convince policymakers that we need to stop shipping highly explosive Bakken crude oil through our communities in favor of a swift transition to clean, safe, renewable energy. There's an amazing lineup of experts and community activists joining the panel discussion! Go to our Happenings page for the flyer and more information. Working with Bergen SWAN and the Open Space Institute, the Hillsdale Mayor and Council is now supporting an application to preserve the Tandy Woods wetlands from development, seeking funding from Bergen County's Open Space Trust Fund and possibly from NJ State Green Acres. We hope this process will go forward without issue, resulting in the Tandy Woods being spared as a beautiful preserve that will benefit our local watershed, and be saved in SWAN Co-Director Mark Becker's honor. Join Us Today in Protest! Join the Coalition to Ban Unsafe Oil Trains and 350N at a vigil to remember the oil train derailment and explosion that devastated the small town of Lac Megantic two years ago. We'll carry signs representing the New Jersey towns and cities along the CSX oil train rail lines calling for a ban on unsafe oil trains, and demanding clean, safe renewable energy instead. The Bergenfield vigil is one of nearly 100 events across North America where people are organizing to stop the dangerous transport of crude by rail through our communities. Each day, in our towns surrounding the Oradell Reservoir -prime drinking water resource for 750,000 residents - up to 30 freight trains run by CSX lumber past, carrying highly dangerous cargo - toxic, volatile crude oil coming east from North Dakota. We know from the accident that occured in February of this year in West Virginia that oil train crashes along rivers are a horror with endless public health and welfare consequences. Other recent oil train crashes have happened in Quebec, Virginia, Alabama, and North Dakota. With public funds dwindling and infrastructure crumbling, such accidents are a terrifying prospect. Please help Bergen SWAN, Hackensack Riverkeeper, Pascack Sustainability, the Sierra Club, and other local environmentally concerned partners to urge our political leaders to place an outright ban on unsafe oil trains traversing our communities. Join the call for far greater and more stringent safeguards for all equipment involved in this industry. For further information, write to CoaltiontoBanUnsafeOilTrains@gmail.com and go to http://explosive-crude-by-rail.org/. Anyone who is interested in joining a coalition of environmental & civic groups to urge Montvale officials to insist on a sensible, sustainable development of the DePiero's property, or wants to volunteer, please contact Lori Charkey at Bergen SWAN, or see the website: www.thinkoutsideofthebox.org. Read the editorial written by Bergen SWAN Co-directors published in the Bergen Record, calling for a more modest development. Click Here. Please COMMENT on our article. Your personal checks are also graciously accepted and will result in the full value of your donation going to Bergen SWAN. From our beginnings in 1988, Bergen SWAN has been aggressively pursuing the preservation of the watershed buffer forests around our drinking water reservoirs. To date, we have helped protect from development over 3,300 acres of woods and wetlands, and over 300 acres of golf courses. The narrow, protective, forest buffers around our reservoirs represent some of the only unbroken stretches of woods in an intensely populated, increasingly urban area. These watershed buffers are a critical link to sound watershed management for the Upper Hackensack, helping to maintain safe drinking water quality for nearly 1 million Bergen and Hudson County residents in New Jersey and in Rockland County, New York. Bergen SWAN is on Facebook! Click HERE to join our Facebook community. Did you know... that there are over a dozen places and organizations in northeastern New Jersey that provide quality nature programs? Recently, several of them banded together to create the Nature Program Cooperative (NPC) – a pooling of knowledge and resources designed to offer the people of our region greater opportunities to explore and enjoy the region’s natural side. 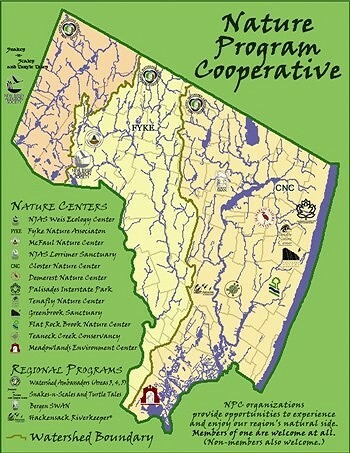 How it works… Throughout the year, each of the different partners of the Co-op (listed on the right side of this page) will host an outdoor activity or indoor educational program at a nature center or other appropriate location to which all group members are invited. When applicable, member discounts will apply to all Co-op partner members and supporters. For example, if Tenafly Nature Center hosts an event, members of all other NPC groups pay the TNC member rate. (Non-members are also welcome to attend the event, but must pay the non-member rate.) All NPC events are advertised in each partner group’s newsletter.